If you’re looking for the perfect present to buy a new mum, or a mum-to-be, look no further than these super-soft muslin bamboo swaddle blankets by Aden & Anais. 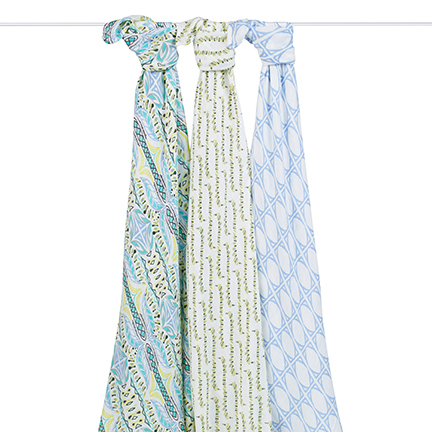 At £38.50 for three they’re not the cheapest muslins on the market (which is why they make a lovely present – chances are mum won’t be splashing out on these herself what with all the nappies and coffee she’ll be buying right now) but they’re the absolute nicest I’ve come across. My wonderful, wonderful sisters-in-law bought me a trio of these before Jack arrived and I still use them every single day. Beautifully soft and really pretty, I love this soft blue ‘Wild One’ colour-way currently available online. Great for swaddling in the early days and then mopping up a multitude of baby-sick, milk, mess and, inevitably, tears, for months to come. Next He’s not difficult. He’s ‘spirited’.